Since opening Green Heiress Holistic Health in Aspinwall, we’ve seen a surge in interest for our yoga and movement classes, and we received requests for more. So, beginning September 2017, your wish has been granted! Green Heiress Holistic Health is excited to announce that we are launching a new yoga program, Green Yoga, on September 5th – just in time for you and the family to head “back-to-school” and get back into a yoga-practicing routine (or create a new one!). While it makes sense to have any subset program of Green Heiress Holistic Health include the word “green” in its name, the name of our new yoga and movement-focused program goes even deeper than that. For starters, green is the color of the heart chakra, and at Green Heiress we are practicing a heart-centered approach to yoga – making the name a perfect match in our eyes. Additionally, the Green Heiress organizers have always been focused on utilizing eco-friendly resources, and Green Yoga will give us an opportunity to deepen our commitment and integrity to green-minded business practices. This is something we are really excited about, and as part of our expanding commitment to green practices, Green Yoga will include new, environmentally-friendly mats, blocks, and cleaning supplies! 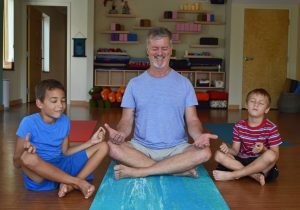 Family Focus Yoga: From classes for caregivers and infants (Om Baby) to child-focused mindful movement, these classes will promote well-being and group mindfulness in a unique way. One subset of our family focused courses will be the Planting Seeds classes – we offer a separate space for toddlers to discover mindful movement, heart-felt story time, and yoga fun. These classes are meant to coincide with yoga for parents in our Movement Studio, but the caregivers are welcome to stay with their little one as well. We also offer Yoga 4 Little Kids (ages ~3-6) and Yoga 4 Kids (ages ~6-12) – classes held in our yoga space that will be more heavily movement-based including yoga games, relaxation techniques, and as always – fun! Caregivers are welcome to stay for these classes as well, but it is not required. Additionally, our Friday evening Family Yoga class is something special for the whole family – time for joy, movement, and bonding side by side on your yoga mats. Family Yoga will be followed by Celebration Yoga, which is just that: a CELEBRATION – and is open to all! Our goal is to make yoga accessible to people of all ages, so we will also be offering Yoga Gold – a class for people with limited mobility due to age, physical restrictions, or anything else. Finally, in an effort to kick off a self-love revolution, we offer a Body Positive class. This class is suitable for all levels and open to all ages. However, we believe this to be a great opportunity for parents and caregivers to spend some quality time with their growing kids as they navigate through a relationship with themselves and their self-image. Power Focus Foundations: Whether your family isn’t quite into yoga the way you are or you just want to build a practice that’s meant for YOU, Green Yoga will continue to offer courses designed to help you as an individual explore and develop your yoga practice. These classes will help yogis of all levels engage in a variety of yoga styles, all focused on helping participants clear their mind and focus on their body, their breathing, and their state of being. Our power yoga classes consist of Power Focus, Power Up!, and Power Shred. Each of these classes is designed to level up a bit in terms of intensity – moving from Power Focus to Power Shred – concentrating not on speed but on focus, activation, and strength. These classes are open to all levels, but be prepared to sweat! We also offer Rise & Shine, an early morning flow class and the perfect way to begin your day, and Beginner Yoga which provides invaluable foundations for those wanting to begin a yoga practice or deepen their existing one. Variations & Traditions: We at Green Heiress like to pride ourselves on the variety of classes we offer. Instead of sticking to one style of yoga, we provide the chance to explore different variations and traditions. Core Focus is a Pilates-inspired flow class meant to align, strengthen, and lengthen. Curating Calm is a beautiful relaxing class combining aspects of restorative yoga, QiGong, and guided meditation in an effort to rebalance the body and quiet the mind. Our traditional yoga classes included Sivananda 5 Point Yoga and Kundalini Yoga, both of which are grounded in ancient tradition and are guaranteed to be a wonderful experience and the perfect addition to your yoga practice. It’s always a good idea to try something new, right? And all variation and tradition classes are suitable for all levels. The main goal of our Green Yoga program is to make yoga accessible to all – demonstrating that yoga is not just for the young, fit and flexible. Yoga is for everyone. All body shapes, sizes, ages, genders, experience levels. Everyone. We want to share this beautiful, healing practice with as many people as possible because we know how life-changing it truly can be. Green Yoga promises to be an energetic addition to our Green Heiress Holistic Health offerings, and we cannot wait to see you this September for its launch! Like us on Facebook (www.facebook.com/greenyogapgh), follow us on Instagram (@greenyogapgh), and don’t forget to sign up for your favorite upcoming yoga classes HERE! We’ll see you on the mat!